SIOUX FALLS, S.D. - For the week ending Sunday, there were 6.1 days suitable for fieldwork, according to the USDA's National Agricultural Statistics Service. Topsoil moisture supplies rated 2 percent very short, 11 short, 81 adequate, and 6 surplus. Subsoil moisture supplies rated 7 percent very short, 24 short, 65 adequate, and 4 surplus. 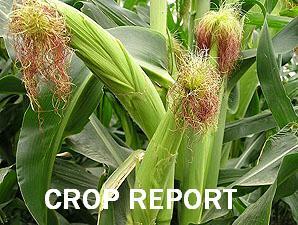 Corn harvested was 90 percent, behind 96 last year and 97 for the five-year average. Sorghum harvested was 94 percent, equal to last year, and near 97 average. Sunflowers harvested was 73 percent, well behind 93 last year, and behind 92 average. Winter wheat condition rated 1 percent very poor, 6 poor, 36 fair, 55 good, and 2 excellent. Winter wheat emerged was 98 percent, near 100 both last year and average. Pasture and range conditions rated 5 percent very poor, 13 poor, 36 fair, 43 good, and 3 excellent. Data for this news release were provided at the county level by USDA Farm Service Agency, SDSU Extension Service, and other reporters across the State.